Anyone living at Woomera, S.A., who had sufficient stamina, could play football in three different codes, each weekend. There was Soccer on Saturday afternoon, Rugby League on Sunday morning and Australian Rules on Sunday afternoon. For a country town of five-and-a-half thousand citizens, it may have been the only place in Australia to have so many different football competitions for that size population. Australian Rules was by far the most popular and best organized. There were five teams in the association, and they were, The Village, West Woomera, The R.A.A.F., Central Woomera and, when they could muster eighteen sober bodies, Koolymilka, or as they were sometimes known, The Sandhill Savages. I was a member of, trained with, and if they were really desperate, played for Centrals. Like all of the other clubs, we had a handful of reasonably talented players who were the backbone of the team, the rest of us just made up the numbers and went along more to get our photograph taken in the red and black guernsey, (Essendon) and enjoy the club social activities than to add significantly to the team's performance. Perhaps, on a good day, we might have beaten a reserve grade team from Oodnadatta, providing we played at home with our referee. There were three playing venues, and each had a very different surface. The grassed oval at the village proper was great, the sand at Woomera West was slow and hard work, but much better than the salt lake at Koolymilka, which was diabolical. It was like playing on super coarse sand-paper and if by chance you came in contact with the surface, as most usually did, the result was a considerable loss of skin; I still have scars on my knees and elbows to remind me. To make it worse, the line markings were done with a mixture of old sump oil and distillate, which when mixed with the salty mud, became a brown, gritty, foul-smelling sludge. Win, loose or draw, after the game there was always a party, it was a great excuse to celebrate and relive the more memorable moments of the match, as footballers do the world over. Most of the guys played as if there was no tomorrow and partied the same way, but there always was a tomorrow and to see the same boys next morning, was a very sobering sight. I often wondered what it was that really did the damage. Was it the game, the Koolymilka salt lake or the post-match party? One of our keenest supporters was a character called Jack Mack. He was the life of every party and next day, as a consequence, suffered more than most through over-indulgence or perhaps it was because of something he ate. Every working day, a fleet of ten articulated buses left the Village at five-minute intervals to take the Range Head staff to work, a distance of about forty-five kilometres. On Mondays it was Jack's practice to catch the first, then, if he felt ill, he would stop the bus and stand by the road, 'Calling for Burt,' until the next one came along. Some days he changed buses four or five times. At the Range Head, we reported in, picked up supplies of fresh film, details of the trials scheduled and at which camera site we would be working that day. We then had to travel in a ten seat, long-wheel-base Landrover to our allotted location, which could be up to an additional ninety kilometres. His was usually the last stop on the run. One morning after a particularly hearty celebration the night before, where Jack had partied long and hard, he leaped from the Landrover at the first camera site and sprinted the thirty odd metres to the toilet block, while the rest of us watched and waited from the security of the vehicle. On reaching the toilets, he opened the door and ran in. Then things happened rapidly. There was a tremendous commotion from inside and the door opened briefly only to slam shut immediately. The door opened again and slammed shut again. 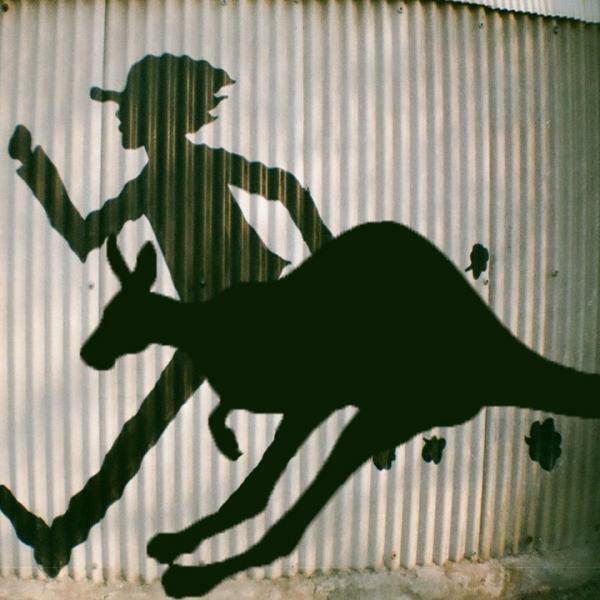 The third time it opened, Jack came flying out, like an Olympic sprinter out of the starting blocks and right behind him was the biggest and angriest kangaroo I have ever seen. The poor animal had probably been attracted by the smell of water and once inside, pushed the door shut. After being imprisoned for a day or two in a corrugated iron prison, when the door opened, he was so eager to gain his freedom that he kicked it shut twice before he and Jack made a successful exit. The consequences of this event were three fold. Apart from a few bruises, Jack was unharmed, his notoriety increased and he had a good story to tell his grand-children, but our post match parties were never quite the same. As for the kangaroo, it probably required extensive trauma counselling. In particular, I think of the amazingly complex system introduced at Woomera for keeping track of the time we spent on each project. As the projects began to reach their conclusion and the work load decreased, the paper work increased, a sort of inverse relationship. By the time I resigned in April 1968 it took me three hours each fortnight to complete my time sheet, and of a section called 'Systems Assessment,' which was established to monitor how efficiently each department was working. In less than two years, it went from zero to five staff then back to zero and no one ever knew exactly what they did or noticed any difference. But in my opinion the absolute winner of the prize for the craziest idea would go to the person responsible for the introduction of 'day-light saving.' In a place that has between thirteen and fifteen hours of sunlight daily, depending on the season, the last thing we needed was Daylight Saving. Many years later when we were living in Toowoomba I thought that day-light saving was great, especially for a keen golfer, and found it difficult to comprehend the opposition that came from country people, who seemed to regard it as some kind of Capital City Conspiracy. However there is no doubt that, the two summers we had it at Woomera were a total disaster, and for two reasons. Firstly the clocks were put forward two hours, and secondly, probably much more importantly, the only people who were subject to it were those, like me, who worked at 'Range E', forty five kilometres away from the Village, where everyone lived and Tech Area, where nearly half the population worked. They were not directly affected and predictably Woomera became a divided community. There were those with bloodshot eyes and the rest. The two major obstacles to the earlier starting time both involved money; the penalty rates we had to be paid and the costs incurred by the department being compelled to provide us with a free breakfast. To have the meal ready by five fifteen, the Koolymilka catering staff had to start work at some really unearthly hour, like three thirty. The extra wages were quite substantial so to make the morning task quicker and thus less costly to the Government; the Mess Supervisor decided that as much as possible should be prepared the night before. Consequently bacon and eggs were cooked on large aluminium trays, allowed to cool in their fat then stored in the walk-in cold room overnight, while toast was made, covered with a tea towel and left on the bench. Next morning they were rewarmed in the large gas ovens. It is difficult to describe just how horrible they were. The bacon and toast became so hard and brittle that cutting it was a hazardous exercise requiring safety glasses for protection against the flying fragments, and the fried eggs took on the consistency of soft, dense, sponge rubber, covered with half-melted fat. Financially it was worthwhile because we were well-paid for the inconvenience but socially we paid a high price. Sleep deprivation was a huge problem. Because of the heat it was extremely difficult to get any sleep before midnight, even if you lay in front of the evaporative cooler, poor man's airconditioning. To start work at six it was necessary to rise at four, to catch the Range E buses at four thirty for the forty five kilometre bus ride and breakfast at Koolymila. The best anyone could hope for was about four hours sleep each night.